My latest blog for Time Out London focuses on the wonderful peace pagoda which is located in Battersea Park. Please click here to read more. Statue of Buddha at the Battersea Peace Pagoda. A more detailed account of the pagoda’s history from one of my earlier blogs can be read here. Officially known as the ‘London Peace Pagoda’, this sacred place was unveiled in 1985, its construction being undertaken by monks, nuns and followers of ‘Nipponzan Myohoji’; a Buddhist religious order dedicated to promoting world peace. This order of Buddhism was founded by The Most Venerable Nichidatsu Fujii. Born on a remote Japanese island on 6th August 1885, Nichidatsu Fujii embraced peace from an early age, becoming a Buddhist monk at the tender age of 19 and shunning the military career which was expected of him. During the 1930s, he travelled to India, where he became friends with Mahatma Gandhi. Gandhi, who with his doctrine of non-violence, proved to be a huge influence on the Buddhist Monk, bestowed his wise friend with the gracious nickname, ‘Guruji’; Guru or course meaning teacher, and ‘ji’ being a term which people in India attach to names and titles in order to denote respect. It was a name which stuck, with Nichidatsu Fujii’s followers happily referring to their mentor as Guruji for the rest of his life. That same August day, the world changed forever when the atomic-bomb known as Little Boy was exploded over the Japanese city of Hiroshima. 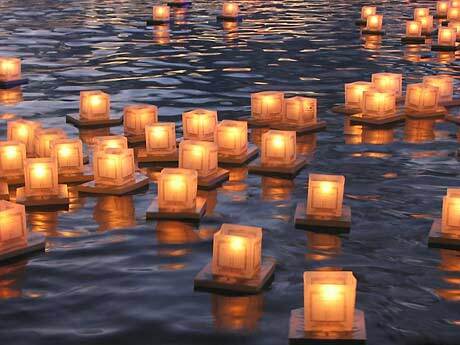 This event was followed a few days later on the 9th August by a second nuclear blast; this time over the city of Nagasaki, forcing a rapid but horrific conclusion to WWII. As a response to the nuclear age, Guruji initiated a programme in which he endeavoured to build Peace Pagodas (also known as ‘Stupas’) all over the world; monuments intended to unite all of humankind, regardless of race, creed or nationality. The first of the Peace Pagodas appeared in 1969, its location being Rajgir in India; a city of great importance to Buddhists, as it is believed this is where Buddha preached the influential, Lotus Sutra. In Britain, there are two Peace Pagodas. The second of course is the one in Battersea Park. In a sad and profound coincidence, Guruji died just 12 weeks before London’s Peace Pagoda was opened. 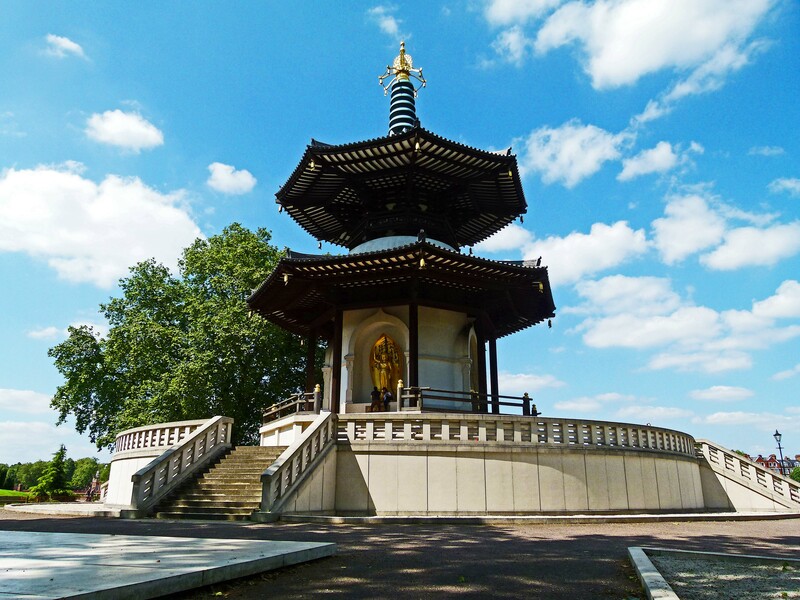 The Peace Pagoda in Battersea Park features four sacred, gilt-bronze statues which chronicle the most significant stages in Prince Siddhartha’s (the Supreme Buddha’s) life… birth, contemplation leading to enlightenment, teaching and death. Thanks to the influence of Guruji, there are currently 80 Peace Pagodas spread across the world. Today, the Peace Pagoda in Battersea is in the care of Wandsworth Council… and, on a far more involved level, the Buddhist Reverend, Gyoro Nagase, who arrived in London from Japan in 1978 and participated in the Pagoda’s original construction. Mr Nagase has much a huge task in caring for the sacred site- you can read more about his commitment here. The Pagoda is open to the public all year round. Its raised level in particular provides beautiful views over the Thames and across to Chelsea Embankment, making it a wonderful place to stand and contemplate; a true oasis of peace and calm in our often chaotic city. If you do wish to visit the Pagoda, please bear in mind that the statues of Buddha, which rest in the upper alcoves, are sacred objects, and it is forbidden to climb upon them; something which many visitors in their enthusiasm fail to realise. The Pagoda also plays host to a number of ceremonies throughout the year; the main ones taking place every June, in which Buddhists from many different backgrounds gather to offer prayers for peace, and on the 9th August (Nagasaki Day) when, at dusk, a floating lantern ceremony takes place, commemorating all victims of war.